The HSM 108.2c Cross-cut Shredder is ideal in busy offices with constant workload. Capable of shredding up to 12-14 sheets of paper, can create 516 cross-cut particles per page, and has a 13-gallon capacity of waste bin. The HSM 108.2c Cross-cut Shredder is perfect for shredding of tax documents, bank statements, and medical bills. It can also shred staples, paper clips, and credit/store cards. This shredder can work continuously with no down time and has a Zero Energy Stand-By feature ensuring that no power is used while machine is in stand-by mode. Protect your important documents with HSM 108.2c Cross-cut Shredder. Cutting size: 1/8" x 1 1/8"
Welcome to MyBinding video. Let’s have a look at HSM’s Classic 108.2 document shredder. There’s a simple forward and reverse toggle switch on the top and a nice 10 inch wide mouth opening, perfect for large and small documents. LED lights lets you know the power is on and whether or not the door is open. 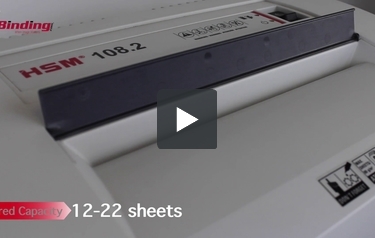 The shred capacity on the 108.2 matters whether it’s a strip-cut or a cross-cut, both options are available and the shred range goes from 12 – 22 sheets of 20-pound paper. Both can handle staples, paperclips and credit cards but when it comes to CDs and DVDs, the strip-cut model only. Its induction-hardened steel cutting rollers are made to last and if you have a jam, simply hit the reverse button, back it out and start it again. The waste basket is accessed from the front and has a whopping 20 gallons in size. The strip-cut model is level 2, cross-cut level 3 in security. That is the Classic 108.2 by HSM. For more demos, reviews and how to’s, check out MyBinding.com. Even small offices can benefit from a central, shared shredder; why purchase several personal devices when you only need one? A perfect system for this use is the HSM 108.2cc Cross Cut Office Shredder. Built to be a mobile shredder in busy offices, this device offers convenient and efficient disposal of all your confidential and unwanted materials. Here is a closer look at the details. Simple operation comes from the many automatic features. With a modern electronic controller, the automatic start and stop shreds only when needed. A reverse button offers quick release of overfed paper if a jam occurs. When not in use, the shredder stays in a standby mode without consuming energy. An LED panel constantly indicates the machine’s operational status. This model is equipped with a powerful, specially adjusted motor for longer shredding periods and high performance. Thermal protection safeguards against overheating. The closed-tooth wheel drive system prevents the incursion of dirt, thereby slowing down wear and increasing service life. A fully enclosed housing further protects against the spread of dust and absorbs sound from the motor, resulting in a quieter shredding experience. A safety shield covers the wide 9.5 inch opening. Up to 11 sheets can enter the blades at once and shred as fast as 18 feet per minute. The result is tiny pieces only 1/8″ by 1-1/8″ in size, providing a level 3 security. This is perfect for multi-purpose shredding of low and medium risk office documents. Paper chads slowly fill up the 12.7 gallon reusable waste bag. When the bag is full or the door is open, the automatic stop cuts power to the motor until the bag is emptied or the door is fully closed. A 20 year warranty covers the hardened steel blades while parts and labor is covered for two years. While this shredder is built for busy small offices, it doesn’t provide continuous use. In places needing higher shredding usage, you may find yourself having to wait while the machine cools down. This may not be an issue in small offices with lighter shredding but bigger offices will want a machine with a more powerful motor to handle their needs. The blades only cut items small enough for a level 3 security rating. For most office purposes, this keeps things safely out of the wrong hands. But businesses with classified material should look into a machine with a high security rating, such as the 125.2 Level 5 or 6. Unlike the strip cut version of this model, the blades can’t take in CD’s or floppy disks. Depending on your needs, this may or may not be a problem for you. If it is, check out the strip cut version of this machine, the 108.2. Even with a few weaknesses, the HSM 108.2cc is well-suited to handle the moderate shredding needs of a busy small office. With automatic features for ease of use and an LED display panel, this device is highly convenient. And solid steel blades keep all your confidential documents secure. We think the HSM 108.2cc Cross Cut Office Paper Shredder is an excellent choice for your next central shredder.